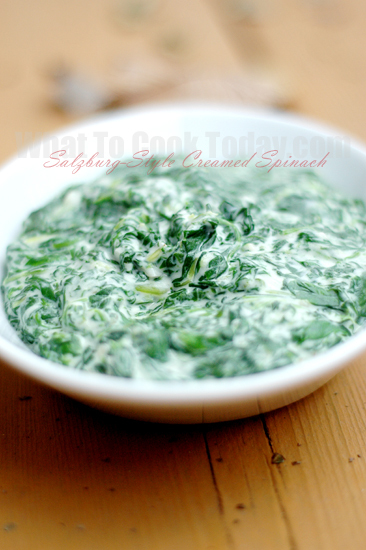 Creamed chopped spinach appears very often on German menus and tables. It is usually seasoned with nutmeg, and the spinach cooking water combined with milk makes up the liquid for the cream sauce. The closer one gets to the Austrian border, the more one finds this garlic-flavored creamed spinach that is Salzburg’s specialty. I can’t think of any better way of cooking spinach, besides stir-frying and cooking with soup (but those gets old fast) than making it into a creamed spinach. It’s so creamy and I love garlic, so this is a perfect dish to me.